Easy to assemble, the Xtender 24 ft. Home Batting Cage allows you to have your own batting cage right in the comfort of your own backyard. 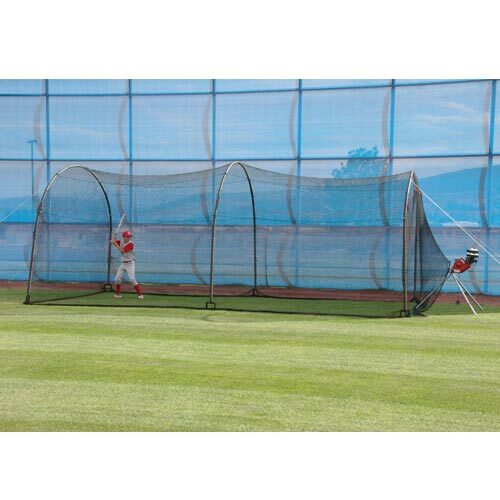 The Xtender 24 batting cage comes with user friendly instructions and sets up in minutes. If you decide later, that you'd like a longer batting cage, like all Xtender series cages, the Heater Xtender 24 allows you to add additional Xtender cages to extend its length. The Xtender 24 foot Home Batting Cage is economical and resilient because of its frame and netting design. The sides of the frame are made of steel tubing and set at ideal lengths to allow the largest swing area possible for its size. The arched scaffolding over the batting cage bends with the wind and will not break due to its flexible fiberglass rods. 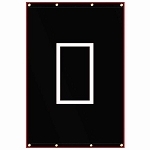 Foam pads are provided which slide over each frame support to protect the frame from the impact of hard hit balls. The Heater Xtender 24 also comes with 1" polypropylene netting which is twice as strong as the regular 2" netting of other batting cages. The netting is so small, it can even be used as a golf cage! This batting cage provides a built-in harness to support a pitching machine so you can practice all day long. To ensure your satisfaction, the Xtender 24 Batting Cage comes with a 30 day money-back guarantee and a 1 year limited warranty. 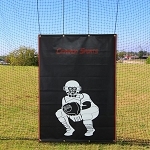 Don't forget to protect your batting cage with a Batting Cage Backstop! To ensure your satisfaction, the Heater Xtender 24 batting cage includes a 30 Day Money Back Guarantee. Xtender 24 foot home batting cages are also backed by a Full 1 Year Warranty that includes repair, replacement and labor. No matter where you order a Heater Xtender 24 ft. Batting Cage from, NOBODY actually stocks them; they all ship directly from the manufacturer's warehouse located in St. George, Utah. Therefore, the shipping time frame is exactly the same no matter what website you order from (we hope that it is this one!). Heater Xtender 24 Batting Cages typically take 2-4 business days to ship from the time you place your order. They ship via Federal Express (FedEx) Ground and could take anywhere from a day or two to a week to get to you AFTER being shipped, depending on your proximity to their warehouse. We will notify you of your tracking number the moment we receive it from the manufacturer's warehouse. Click here to download an easy to read, printable PDF of the Heater Xtender 24' Batting Cage Owner's Manual.